Welcome to the Career Services Alumni page. Career Services is available to answer any job search-related questions. Please take a moment to see what our office has to offer. Career Services can help. Sign up for DIGGERecruiting - DR 2.0, Career Services’ online job search tool. DIGGERecruiting can help you find and apply for jobs and sign up for career events. Log in to DR 2.0. To find out more about DIGGERecruiting, please visit the Alumni DIGGERecruiting page. Career Services also hosts a career fair each semester. Check out the Alumni Career Fair page for more information. 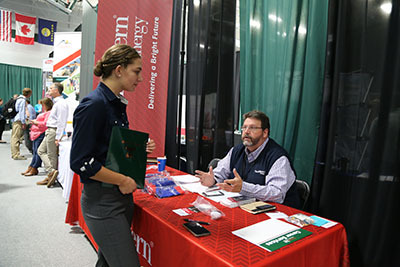 Career Services can help you recruit quality Montana Tech students and alumni for internships and full-time jobs. Contact Career Services at (406) 496-4140 or careerservices@mtech.edu for more information. Encourage your employer to sign up for the Career Fair. Employers can meet with potential applicants during the fair and conduct interviews on campus the next day. Visit the Employer Career Fair page to find out more. Informational Interviews: Informational Interviews are designed to let students “interview” alumni about their current positions and work experiences. These interviews help students get a feel for what the job is like and decide if they are still interested in that field. Information Sessions and Class Presentations: Visit campus and conduct an Information Session or Class Presentation to get students interested in your company or to share your employment experience and career advice. Practice Interviews: You can also conduct practice interviews for students during your campus visit. Practice interviews give students a chance to get a feel for an actual interview with your company. Resume Reviews: You can also share feedback on student resumes during your campus visit or from your office. Career Services can collect resumes and provide them to you in a packet. This will give students a chance to get feedback from an employer or hiring manager, BEFORE they are applying for an actual position. For more information on ways to connect with current students, contact Career Services at (406) 496-4140 or careerservices@mtech.edu. Got a Job? Report it!